So Happy GSD Journey Chose Me! I raised a litter of pups for my Veterinarian. I had chosen a sable pup, but one day when I went out to feed, they all took off running into their shelter. This pup stopped, looked at me and sat patiently. I had to go back to the house for something, and when I came back out she was still the only one sitting, waiting... I began bringing her out of her pen, taking her with me in the truck, spending more time with her. We clicked - she chose me! She is now 10 weeks old, and just a complete joy. When my feet move, she's right beside me. When I stop, she stops and sits at my side. The first day I had her in the house, she went to the door to go out and potty. She is so smart, very sweet, and I am so excited to start our journey in life together. This is the story of my GSD Journey. 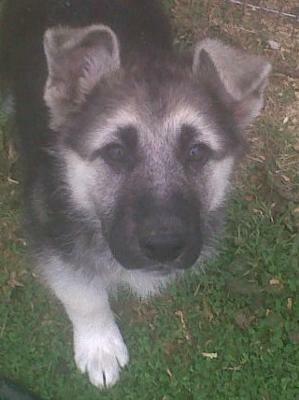 Hello Jodi, what a great German Shepherd puppy story. And thank you so much for sharing your great story about your wonderful German Shepherd puppy Journey. And what a wonderful picture - I absolutely love it! Too cute! And a great name too. I always loved Journey back in the 70's - one of my favorite bands still. She is absolutely adorable.